Go hunting for fish in the technicolour and exciting world of Ocean Fantasy. Ocean Fantasy is an English version fish game featuring vibrant, bright and fun underwater scenery that is filled with 29 animated fish characters, some with special functions that help players earn more points. Up to 8 people can play Ocean Fantasy at any one time. Players are treated to three different underwater scenes. Combined with new fishy characters, such as Ghost Submarine, Lantern Fish and Rage Swordshark, these scenes offer Ocean Fantasy players an exciting gameplay experience. The more fish you shoot in these scenes, the more points you earn. The higher the points, the bigger the payout at the end of the game. Each of the fish has different values, starting from low odd fish through to high odd fish, boss characters (Crab King, Ghost Submarine and Prehistoric Crocodile) and special function fish. Using special characters and features help you earn even more points. <b>The low odd fish are:</b> Ghana Fish, Clown Fish, Flat Fish, Porcupine Fish, Lion Fish, Flounder, Lobster, Spearfish, Octopus, Lantern Fish, Sea Turtle, Saw Shark, Bat Fish <b>High odd fish:</b> Giant Clown fish, Giant Flatfish, Giant Porcupine Fish, Shark, Killer Whale, Whale King, Fire Dragon, Ghost Submarine, Prehistoric Crocodile, Crab King <b>Fish with special functions:</b> <b>Glowing Fish:</b> All the same kind of fish as the glowing fish on the screen will die when you it Lightning Chain: This randomly give the player 1 to 15 fish with 2-100 times for free <b>Serial Explosive Crab:</b> A mini game character that explodes when caught, catching and damaging the fish on the screen in range of the explosion <b>Laser Crab:</b> When caught the Laser Crab gives the players a special Laser Beam weapon which will catch all the fish the beam hits. But you have to be quick because players only get one shot that lasts for 10 seconds <b>Bitgun Crab:</b> A lot like Laser Crab, the Bitgun lasts for 10 seconds <b>Rage Swordshark:</b> This gives a plater a unique one shot kill. It’s a random feature and worth 150 times Other Ocean Fantasy features include: •	The game supports horizontal cabinets for four, six and eight players as well as vertical cabinet support for up to four players •	Adjustable gun settings for operators •	Targeting function: Pull the joystick upwards to target the Glowing Fish and Lightning Chain Fish. 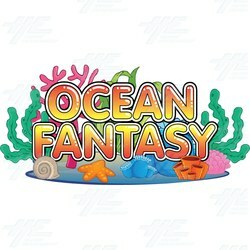 Pull the joystick downwards to target big odds fish Ocean Fantasy is available to buy on its own (gameboard kit) or can be shipped with Arcooda’s six or eight-player fish machine. Go hunting for fish in the technicolour and exciting world of Ocean Fantasy. Ocean Fantasy is an English version fish game featuring vibrant, bright and fun underwater scenery that is filled with 29 animated fish characters, some with special functions that help players earn more points. Up to 8 people can play Ocean Fantasy at any one time. Players are treated to three different underwater scenes. Combined with new fishy characters, such as Ghost Submarine, Lantern Fish and Rage Swordshark, these scenes offer Ocean Fantasy players an exciting gameplay experience. The more fish you shoot in these scenes, the more points you earn. The higher the points, the bigger the payout at the end of the game. Each of the fish has different values, starting from low odd fish through to high odd fish, boss characters (Crab King, Ghost Submarine and Prehistoric Crocodile) and special function fish. Using special characters and features help you earn even more points. Ocean Fantasy is available to buy on its own (gameboard kit) or can be shipped with Arcooda’s six or eight-player fish machine.